This morning we leave Cape Town heading northwards along the Atlantic coast to the west of the country to the West Coast National Park along the turquoise waters of the Langebaan Lagoon. In spring the dunes and wetlands explode into fields of wild flowers of many colours. The migratory bird and various species of animals can be seen all year round. Lunch alongside the Langebaan Lagoon. Then to famous the West Coast Fossil Park which is known to palaeontologists world wide. The exceptionally well-preserved fossil fauna remains, bears, elephants, giant giraffe and lion that date to circa 5.2 million years, are displayed. Continuing along the coast from St Helena Bay to Eland’s Bay, the latter famous for surfing, crayfishing and archaeological discoveries, to a farm on the banks of Verloerenvlie, an important Ramsar Wetland. After leaving Eland’s Bay we head to Lambert’s Bay, known for its diamond diving and crayfishing communities. Seafood barbecues are a tradition in summer. From the harbour we walk along the seawall that leads to Bird Island the world’s largest gannet colony. We head up the panoramic Vanrhyn’s pass in the Kouebokkeveld to the pretty town of Nieuwoudtville with its streets lined with historical sandstone buildings. In town, the gorgeous Neo-Gothic sandstone church forms the heart of the place. It is extremely popular during the wild flower season due to its unique placement in the Karoo plain and has a reputation as the bulb capital of the world. Just outside of town you will find the Nieuwoudtville waterfall, decidedly underrated despite it being one of the most beautiful waterfalls in the country which makes it more of a wonder for the impact it has. Other than that, there is the local sandstone ruins, glacial pavement and the Oorlogskloof Nature Reserve. Leaving Nieuwoudtville we drive through “Bushman Land”. Next is the “Tankwa Karoo National Park” on the banks of the mighty Orange River and then to the Augrabies Falls National Park. These falls are among the highest, the name is derived from the Khoi word meaning “place of great noise”. Accommodation in a National Park chalet. This morning we follow the Orange River, driving through Upington, founded in 1873, the gateway to the Kalahari. We arrive at the Kgalagadi Transfrontier Park which was created in 1999 by merging the Kalahari National Park in Botswana and Gemsbok National Park. This is the first Transfrontier Park in Africa. Where the red dunes and scrub fade into infinity and herds of gemsbok, springbok, eland and blue wildebeest follow the seasons, where imposing camel thorn trees provide shade for huge black-mane lions and vantage points for leopard and many raptors… this is the Kgalagadi Transfrontier Park. Included: is a late afternoon 4×4 Safari with a qualified ranger coming back after an amazing Kalahari sunset. Relax around the camp fire for your evening delicious bush barbecue. Early morning, we depart for to Mata-Mata Rest Camp viewing big cats, leopards and cheetahs on our way including the unique black maned lions and admire the Oryx and other antelope species which are the pride of the Kalahari Desert. Bird species that are present year round include Woodpecker, Hoopoe, Pied Barbet, Swallowtailed Bee-eater. Pearl-spotted Owlet and Whitefaced Owl are common while Scops Owl can be seen or heard. Striped Kingfisher occur throughout the year, Great spotted Cuckoo can also be seen in summer. The camp is situated on the banks of the Auob River on the western boundary of the Park. 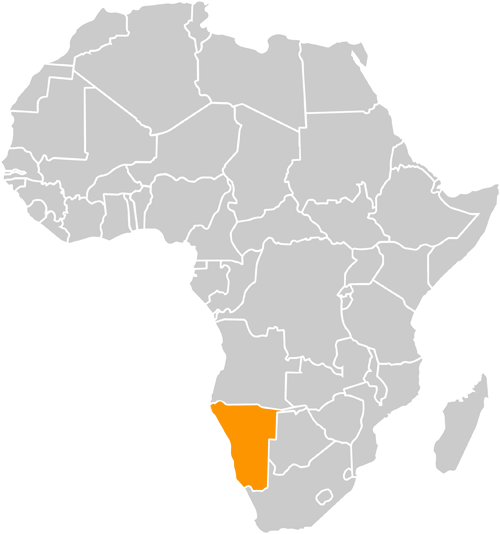 It borders Namibia and is surrounded by thorny Kalahari dune bushveld. Giraffe, typically adapted to these arid conditions and are a favorite sight around Mata-Mata. The camp has a swimming pool and shop. Optional 4 x 4 sunset safari with professional guide. After breakfast we travel to Keetmanshoop and visit the Giant’s Playground, named as such as huge dolorite boulders lie in bizarre rock formation as if giants played with them and left them there. We also visit the Quiver Tree Forest because bushmen traditionally used its branches to make quivers. The forest is spontaneous; the tallest quiver trees are two to three centuries old and is also called an upside down tree because the “leaves” look somewhat similar to roots. This tree has a long history of beliefs that it will bring good luck to anybody that worships a tree and nurtures it. We also explore the Mesosaurus Fossil Site which is probably one of the most convincing examples to prove the drifting of continents. The same genus in the rock formations is to be found in both southern Africa and South America. In southern Africa the fossils can be found in the Whitehill formations, while in South America they are to be found in the Irats formations. An early start for our journey to the heart of the Fish River Canyon where we enjoy a sunrise over the canyon. The Fish River Canyon is located in the south of Namibia. It is the 2nd largest canyon in Africa.. It features a gigantic ravine, in total about 160 km long, and 27 km wide and in places almost 550 meters deep. The Fish River Canyon, which now flows only during heavy rainfall, is the second largest canyon in the world after the Grand Canyon; the scenery is magnificent! Lunch is a picnic; a day to relax! We head through to the Orange River which is the Richtersveld Park and a UNESCO World Heritage Site for it’s cultural heritage and botanical diversity. The Richtersveld area with the majestic mighty Orange River flowing through is awesomely beautiful. Incredible sunsets across the river onto the barren but stunning Richtersveld mountains. A morning river kayaking is a must. Thereafter we drive south through the desolate and forbidding landscape, seemingly devoid of life, except for some people dotting along the horizon. Make a startling discovery upon closer inspection when the mirage dissolves into the human-like half-mens (half person) and the harsh environment prove to be a treasure-chest. After a 5 hour drive we arrive in the Cederberg Mountains with its spectacular mountain landscape and a treasure house of pre-colonial rock art and has a rich botanical diversity, being part of the Cape Floral Kingdom of South Africa. A major portion is a proclaimed Wilderness. Tonight we stay at the The Baths, which is a is a hot spring resort nestled on a citrus farm near Citrusdal, Western Cape. There are both cold and hot pools, with the waters reaching 43˚C at the source. Other features include mountain rock pools, spa baths, a tennis court, trampoline, pool table, and kiddies’ playground. After breakfast, we hike in the mountains of the proclaimed Cederberg wilderness area. We admire the incredible rock formations, visit the caves and magnificent cave paintings left by the “Bushmen” which are still in a immaculate condition. During the flower season in August/September the landscape is covered in carpets of multicolored flowers. Our last stop will be Bloubergstrand for a walk on the beach, an ‘aperitif’ perhaps and enjoy the postcard view of Cape Town, Robben Island and the famous Table Mountain.